If you’re using Microsoft Word 2011, Pages, or any other word processing application that supports Microsoft Office’s .docx format, it’s unlikely that you worry too much about whether or not your word processing application can read Microsoft’s new file format. But there are occasions when converting a massive number of Microsoft Word files to Microsoft’s old or new formats becomes a necessity. If you have a large conversion task at hand, Batch Docx Converter is sure to to get the job done in a flash. The way the application works is very simple: Select the filetype you want to convert—either .docx to .doc or .doc to .docx—drag all the files you want converted to the converter’s main window, then click the convert button. In an instant Batch Docx Converter creates a new folder on your Desktop and fills it with your converted files. Your original files remain intact and in their original folders. Essex Redevelopment claims that the Batch Docx Converter can convert documents at a rate of about 500 per minute. I didn’t have 500 files to convert, but I found the application to be quite snappy. My only complaint (and this is rather minor) is that Batch Docx Converter overwrites the folder it creates on your desktop every time you convert a new group of documents. So you’ll want to make sure that you move your converted documents to a new location after every conversion. 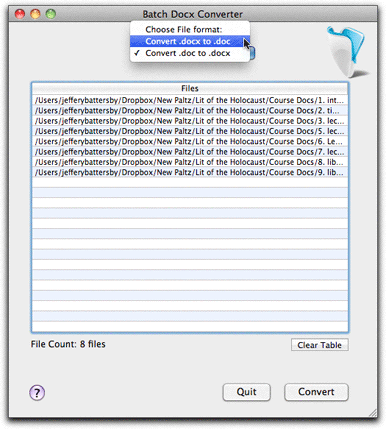 Otherwise Batch Docx Converter is a quick and easy way to manage mass document conversions.